FLETCHER ARROWFLYTE + MERCURY 60 HP OUTBOARD IN TIME-WARP CONDITION. 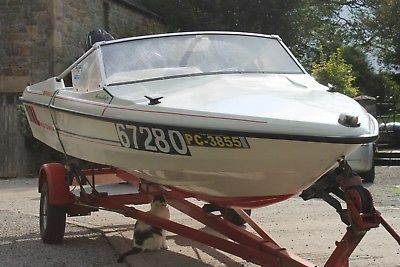 ALMOST CERTAINLY ONE OF THE BEST AVAILABLE ANYWHERE COMPLETE CLASSIC SPEEDBOAT PACKAGE, EXACTLY AS IT WAS SUPPLIED FROM NEW.FANTASTIC, COMPLETELY ORIGINAL, CONDITION. A GENUINE TIME-WARPMINIMAL USAGE FROM NEW – OBVIOUSLY BEAUTIFULLY MAINTAINED ALL ITS LIFE & SHE LOOKS VIRTUALLY AS A YEAR OLD BOAT.THE BOAT, ENGINE, SEATS, FLOOR ETC ARE AS NEW & IN IMMACULATE CONDITION.INCLUDES A TRAILER IN EQUALLY EXCELLENT CONDITION.More information: 078956 380066 THE BOAT: VIRTUALLY AS BRAND NEW. ESTIMATED LESS THAN 150 HOURS OF MAINLY FRESH-WATER USE. Immaculately maintained, winterised and serviced. Always correctly stored inside and under cover. No damage, no gel coat problems, no leaks, no scuffs … she presents beautifully As reviewed when new, the Fletcher Arroflyte was renowned for its speed, lightness, handling and stability. My boat planes fantastically well, is very stable and has exceptional handling still. Fitted with: navigation lights, ski bar, steps and a full set of controls and steering. There’s a locker, all the manufacturers handbooks for the boat, engine and controls, flares, anchor, ropes, pair of paddles etc. The cover is in excellent condition and fits over the entire boat. THE MERCURY 60 HP 2-STROKE OUTBOARD MOTOR: VIRTUALLY AS NEW, IN EXCELLENT CONDITION WITH ELECTRIC START, AUTO OIL MIX SYSTEM, POWER TILT AND TRIM; ALL ORIGINAL EQUIPMENT, NO DOUBT AS SUPPLIED FROM NEW. Excellent, reliable, powerful and in fantastic condition, with minimal hours. Excellent compression on all cylinders, regularly serviced, new impeller, leisure battery, carburettor overhaul, plugs and timing tune. Cockpit controls also regularly serviced. Gears and all cockpit controls work well. Very good water flow, virtually unmarked propeller and engine/transmission casing. Recently serviced by NEWS Marine Services and carburettors overhauled by Birchell Marine. TRAILER: WONDERFUL TOWING TRAILER, LIGHTWEIGHT, STABLE AND IN EXCELLENT CONDITION Fitted with winch, new bearings, new tyres and fully serviced.